I love to feed people, I love the satisfied look on their face after a big feast, I love how food can always make us happy. Naturally, I always give food gifts to my friends and loved ones. I know Cupcakes are so yesterday, but it never fails to make me happy so who cares if they are cliche. Be it the pretty cupcakes with fanciful toppings, or the plain ones with a messy and rustic look — it is always nice to see a cupcake. If you want to give cupcakes as part of your Valentine’s Day Gift, Marmalade Pantry has some of the best cupcakes in Singapore. You can also look for customised cupcakes from online bakeries. Give me a box of macarons and I will love you forever. Macarons are delicious little devils, they are like love potions sealed within the shell. How can something so small be so intriguing? They are the perfect food gifts for Valentine’s Day. Do I really need to elaborate about giving chocolate on Valentine’s Day? There are several Chocolatiers in Singapore like Laurent Bernard, Truffls, and Jewel Artisan which offer delicate and beautifully crafted truffles. Jelly Hearts Cheesecake is a dessert sold in Singapore by online bakeries. Maybe it is the fact that I am not a baker, so the Jelly Hearts recipe seems a little complicated. Basically, each Jelly Heart consists of a cheesecake square base topped with heart shape strawberry piece within the translucent jelly. There is no nice dinner, fanciful holiday or diamond ring, but you can have my jelly heart. Even though the title of this post is Valentine’s Day Food Gifts & Presents Ideas, you can also use this guide for other occasions like Christmas Food Gifts, a gift exchange session, or simply as a present to your partner. Just one thing to note, the food gift should not be your only plan, it is just a nice little surprise. You should have a real Valentine’s Day Gift prepared. Instead of spending money on flowers that never last, why don’t you DIY a chocolate flower bouquet as your Valentine’s Day present for your date? Happy Valentine’s Day! // Read my recommendations of romantic restaurants for Valentine’s Day Dinner. Great blog entry! Definitely helpful for the clueless! Eh, the jelly hearts photo is beautiful! Which of the 3 bakers provided it? I wanna buy some! the jellyheart person is call candie not candice. Genia: I bought it from Edwin. Cleartear: thanks for pointing out the typo! Thanks! Gonna place my orders now! Those jelly hearts are just beautiful! Happy Valentine’s!! brad, hehe cos she is my friend, thus i know. 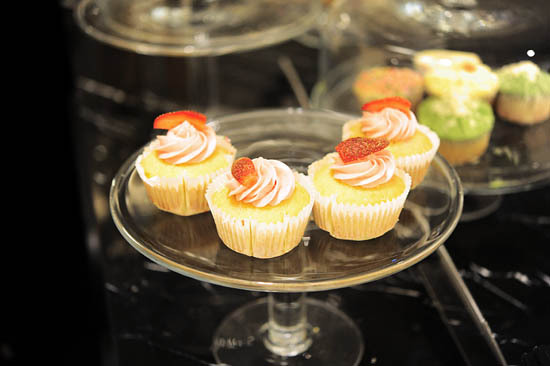 Try the cupcakes at dessert.cup at raffles city basement! It’s delicious D They sell cupcakes, parfaits, liquid granitas,jumbo cupcakes and cookies! I felt that Awfully Chocolate’s cupcakes aren’t as good as the cake. I bought 2 cupcakes, one chocolate and the other white chocolate from their franchise at ION Orchard. The chocolate/white chocolate was good, but the cupcake was too dry. Better bets for good cupcakes, I rather go Twelve Cupcakes (the quality is variable across outlets, oh well) and Plain Vanilla (only 2 outlets but the cupcake quality is amazing in terms of moisture and the fragrance but the icing is too sweet for me). I also second Swirls Cupcake along Robertson Quay, typical American cupcakes. Should try to recommend different bakeries, the quality we have in Singapore is not bad at all.